Join your friends and colleagues in Palm Springs. Check out who is attending! PALM SPRINGS for the next Chapter Meeting! Warm sun, cool style, world-class events, stunning national parks and offbeat attractions. The nine cities of Greater Palm Springs offer endless experiences for all travelers – but what ties all those experiences together is a sense of CHILL. Whether it’s soaking up the sun at a pristine pool, hitting one of the more than 120 golf courses, shopping on El Paseo, getting off-road and offline near the San Andreas Fault or stepping back into that midcentury modern mood, your experience in the destination is about unwinding and taking it all in. The deadline to register for the 2019 Eastern Chapter Conference is April 15, 2019, at 5pm EST. Cancellations received by noon on April 30, 2019, will receive a full refund, minus a processing fee of $30. Cancellations received between May 1 and May 25, 2019, will receive a half refund and those made after May 25, 2019, at noon EST, will not receive a refund. For conference cancellation, please contact Cathy Kruzic at cathy@kruzic.com. The Hotel Paseo is the host hotel for the conference. The $36 million, three-story, 150-room hotel is a 2018 new-build boutique property located in Palm Desert, just steps from El Paseo, the “Rodeo Drive” of the desert. Enjoy upscale shopping, art galleries, restaurants, and nightlife on El Paseo. Retreat to a well-appointed guest room where a private balcony showcases stunning views of the San Jacinto Mountains and a lush valley of palm trees. Rooms are bathed in soft gray, white, and light blue tones that evoke relaxation and serenity. Accommodations for nights of June 10, 11, and 12 are included in your registration. We will provide your lodging information to the hotel via a master list created from your registration information. Please do not book directly with the hotel. Traveling through Palm Springs International Airport (PSP) sets the tone for your visit in Greater Palm Springs. Passengers exchange the long lines and wait times at most airports for a relaxing open-air stroll along outdoor walkways and lushly landscaped courtyards with gardens, water features, and original artwork. PSP was named one of “America’s Most Stress-Free Airports” by Smarter Travel. Ten airlines fly nonstop to Palm Springs International Airport (PSP) from 21 destinations, with more than 500 connecting flights from around the world. 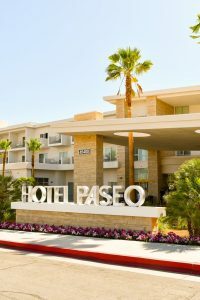 The Greater Palm Springs Convention & Visitors Bureau will provide all Conference attendees arriving on June 10 and departing on June 13 complimentary round-trip ground transportation between PSP and Hotel Paseo. Information on how to access the ground transportation will be sent to you in advance of the conference. For any questions, regarding Greater Palm Springs contact Joyce Kiehl, jkiehl@gpscvb.com, 760.969.1338.